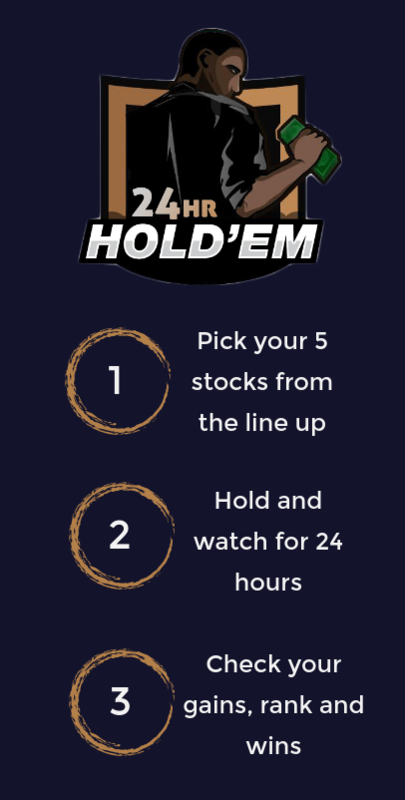 The 24hr simulation is based on the performance of a lineup of stocks over, you guessed it, a duration of 24 hours! Perfect for absolute beginners. Join a simulation under the 'Hold 'em' tab in the 'Earn' Lobby. If it requires a Premium or Pro account and you'd like more information on how to subscribe, click here. When you enter this simulation, you'll need to choose 5 stocks from the given list. These stocks will form your lineup for the next 24 hours. Maxine, who has a Pro account, joins the Tuesday US Special 24hr simulation in the 'Earn' Lobby. When joining the simulation, she selects 5 stocks that she believes are set to perform particularly well over the next 24 hours. She uses the news streams to confirm and builds her stocks lineup. Throughout the day she monitors the performance of these stocks. At the end of the simulation's 24 hours, her five stocks have collectively grown by 2.6%. This places her in sixth spot in the leaderboard!